If you’re a huge fan of waterfalls and nature treks, then don’t miss out when you’re in Maumere. Just 56km away in Wolonira Village, you’ll find the stunning Murusobe Twin Waterfalls that freefalls from a spectacular height of about 100 metres. 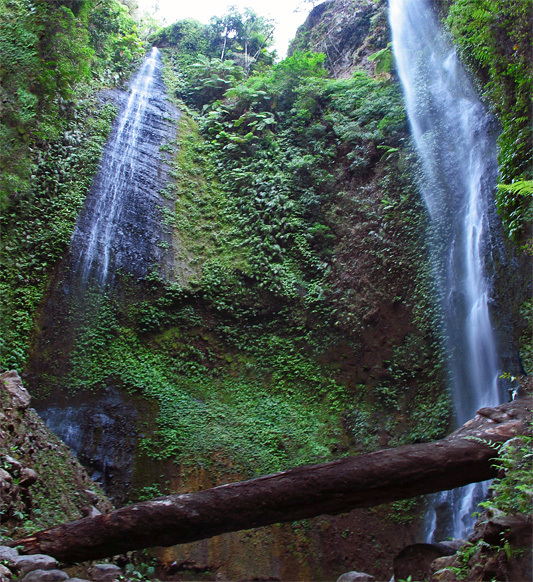 There are three different ways to get to the waterfall, and it depends on your time and physical condition. The first option would take you one hour and begins at Wolonira Village, which is 56 kilometres from Maumere. The best way to get here is by private motorbike or car. The second option would take about two hours and begins at Loke Village. The third option, the hardest one, takes about 4 hours and begins at Deturia. After 3.5 hours of hiking, you can rest at Poma, a small village, before continuing on for the last 30 minutes. During your hike to the waterfalls, you will come across rain-fed rice fields, lush clusters of coffee, cacao and candlenut trees. Once you’ll arrive at the waterfalls, nature’s astounding beauty will amaze you. Watch the waterfalls cascade down from high up above you and swim in the surrounding water ponds. Fun fact: “Murusobe” means “straight plunge” in the local dialect with muru meaning ‘plunge’ and sobe meaning ‘straight like a bamboo pole’.